First of all, let me just say this isn’t a soap-box sermon. I know first hand through the loss of three grandparents how devastating cancer can be. Because I was older, I remember most vividly my Momma Pearl going through her fights with cancer. I watched as cancer completely digested her body. She first had a complete mastectomy, which was a terrible blow to this beautiful woman. Later she had a colonoscopy. As my Dad became the one to have to clean the bag, she lost her self-pride. As the cancer progressed, she could no longer form her own words, hold open her eyes, hold your hand, or even control her own drool. I can personally attest to you that cancer is one of Satan’s greatest demons loosed upon us today. 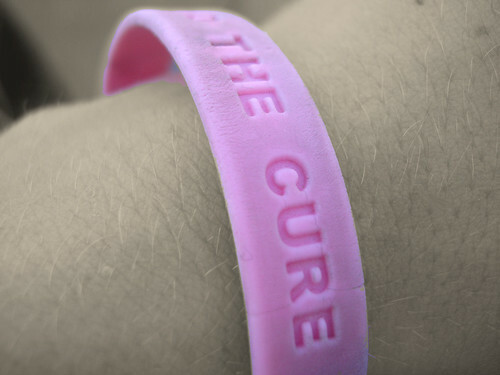 But I can also tell you today there is a cure: Faith. Faith is a funny thing. We have it, but only as much as we can understand ourselves to have. For example, I have faith to believe God saves because I’ve experienced it first hand. I can even tell you God cures migraines because He has taken them from me. I can tell you that God can heal a broken heart, change your finances, give you wisdom beyond your understanding, give you friends who are true friends, and on and on. This is the faith I have because I’ve experienced it first hand, and I understand it is possible. But what about new challenges and trials? How will you respond when you’re faced with something bigger than your faith, like cancer? For that purpose, God has provided those around us who can strengthen our faith, and His Holy Word. Through His Word, which will generate a new faith in you if you allow it, yes, even cancer can be cured. Is God limited in His healing power? Is cancer too great for God to cure? Is there proof of God’s strength in healing diseases? Are there evidences we can look to as a means of support to our faith? Yes! Read that again – “ALL kinds of disease”. The verse isn’t worded that way by mistake because the Bible is the complete, infallible word of God. It’s meant to include cancer and anything else that our bodies can become inflicted by. Jesus had power to heal all sickness. Jesus still has that power. He didn’t lose any strength in His death and resurrection. In fact, He shared that strength with us through the Holy Spirit. The question arises, if this is true, then why are prayers not answered? There are two conditions in this passage, the first of which is “anyone who has faith in me”. Again, our faith is limited by what we can understand to be possible. But Jesus tells us to believe on the evidence of His miracles, which will provide strength to our faith. He gives us events to look to and say, “yes, Jesus can do this because He has done it before”. Can we believe the miracles were performed? Can we trust the Bible to be the complete truth? If so, we can depend on the miracles that Jesus performed to strengthen our faith. The second condition is we must ask him “for anything in my name.” Our power is only through the shed blood of Jesus, which is given to those cleansed by salvation. We can ask God for healing because Jesus has provided the path – the connection – for us. By His stripes, we are healed! In Jesus name, all things are possible! Anything we ask in Jesus name, even for the complete healing and recovery of someone with incurable cancer, Jesus says “I will do it”. It’s not that Jesus’ name is some magic word. Asking for something in Jesus name means that we come to the throne through Jesus, proclaiming Him as our authority to ask of God the things we need. This is the promise we must stand on, that whatever we ask for in Jesus name, believing in faith and without doubt that we will receive, will be ours. God doesn’t break His promises because that would mean God lies. Does God lie? Absolutely not! In Titus 1:2 it says he cannot lie. In fact, the one and only thing God cannot do is lie! So what are we to do now that we know (yes, KNOW) that God will heal those with cancer through our faith, and the shed blood of Jesus which gives us the ability to approach the throne of God in prayer, and ask for it? Look at what Jesus did before Lazarus was brought back from the dead. Jesus praised God! He thanked him BEFORE Lazarus was brought back from the dead. He knew, just as we KNOW, that healing was imminent! We don’t need to continually pray for the healing to come, we need to praise God for it as affirmation of our belief in His Holy Word without doubt that healing is being accomplished! And again, if Jesus can bring Lazarus back from the dead after his body has not breathed a single breath in four days, what is curing cancer to Him? Either we believe the Bible’s recollection of this event to be true, or we don’t believe the Bible at all. If there’s one fallacy in the Bible, then the whole book is subject to question. But, time and time again, even history has proven the Bible to be true. Even archeology has proven it. The Bible is God’s Holy Word, complete and without flaw. When your faced with a big trial as large as cancer, sometimes it’s hard to pray. Your words won’t come because your heart is so heavy, your spirit is filled with fear, and your soul is broken. Jesus experienced this himself when he went to Lazarus. It says he was “groaning in Himself”. This is the communication of the Holy Spirit within us when we are too weak and broken to communicate. In Romans 8:26 it says “Likewise the Spirit also helps in our weaknesses. For we do not know what we should pray for as we ought, but the Spirit Himself makes intercession for us with groanings which cannot be uttered.” Don’t be worried because when you pray you can’t find the words. Pray anyway! Give God time alone with you. He will hear your heart through the Holy Spirit, He will heal your brokenness, and He will do the talking. Perhaps the fear of this disease, which I know so many have seen in their families through the years, has overtaken your hope. I want you to see a guarantee that God provides for QUICK healing. That’s right – a guarantee! I must remind you God does not lie. Therefore, this verse is a lock-tight guarantee from Almighty God. God says to fast, to give your bread to the hungry, your clothes to those that have none. God is saying to sacrifice the things your body wants and needs to bring forth his mercy and attention. Any mother knows the pain of watching her child do without anything they need. If your baby is hungry, you’ll skip a meal yourself to feed it. If your child is sick, you’ll forget your own sickness to tend to them. If your child is heartbroken, you will carry the pain with them. If we are affected by our children’s needs so greatly, then how much more will God be affected by ours through fasting? Fasting doesn’t have to be complete abstinence from food. What do you enjoy most? Is it television? Is it quiet conversations with a friend? Is it the computer time? Is it chocolate? Is it new clothes? Whatever it is – give it up until you see healing occur. Give the thing you love to others. Sacrifice to bring about God’s attention, and show your earnest in your prayers. Then He says “Your healing shall spring forth speedily”. If God can bring the planets and all creation into existence in 6 days, how fast do you believe He can bring healing? Can you believe God for this promise? Can you trust Him to do what He says He will do! We now know that it’s not that God can’t do it, and it’s not that God won’t do it. Perhaps Satan has led you to believe that this is God’s will. He’s such a liar! And if by reason of strength they are eighty years”. These are the lengths of our lives in God’s eyes. You have to understand this is His will for our lives, 70 years, or 80 if we are strong. God doesn’t punish his people through sickness and death. That’s Satan’s work! God provides even greater than 80 years to you in yet another promise! In Exodus 20:12 He says "Honor your father and your mother, so that you may live long in the land the LORD your God is giving you.” To live longer than the allotted time is to be beyond 80 years. Ephesians 6:2 says this is the first commandment with PROMISE. That’s right! It is a PROMISE from God, which will not be broken! Maybe the lie Satan is giving you is that healing cannot come because the cancer or disease you’re facing is a punishment from God. Does not forgiveness from a repentant heart take away our punishment and sin? Psalms 103:12 says “As far as the east is from the west, so far has He removed our transgressions from us“. Think about that! There is no end to be found. Your sins are gone forever. Moreover, Isaiah 43:25 God says "I, even I, am he who blots out your transgressions, for my own sake, and remembers your sins no more.” He forgets your sins! If He has forgotten them, will punishment remain? Absolutely not! 1. God, working through His Son Jesus has healed us of all diseases, and there is no limit to His ability. 2. Through Jesus and the indwelling of the Holy Spirit, we are granted even more authority to do great things in His name. 3. God is affected by our prayers and fasting, which bring about quick healing. 4. God has guaranteed us at least 70 years by His standards. Anything less is due to an attack from Satan. 5. God does not punish those who have asked for forgiveness through sickness and death. So, I must ask you now….